Dr. Monti Harpalani, D.D.S. grew up in the Houston, Texas area where he attended nearby Langham Creek High School. He then continued his studies in Information Systems Technology at the University of Houston. While attending University of Houston, he found a passion for the healthcare industry while working for a local dentist in the area. Dr. Harpalani received his Doctorate in Dental Surgery from prestigious New York University College of Dentistry and graduated in 2010. 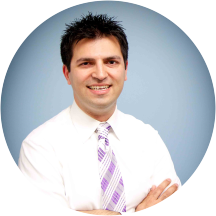 While there, Dr. Harpalani became proficient in all aspects of dentistry. After completing dental school, Dr. Harpalani served a one year General Practice Residency at Woodhull Medical Center in Brooklyn, New York where he received further training in areas of restorative and cosmetic dentistry, pediatrics, endodontics, and oral surgery. With a desire to be close to his friends and family Dr. Harpalani moved back to the Houston area upon completion of his residency program. He enjoys playing basketball, traveling, and spending time with family as well as cheering on his Houston Texans and Houston Rockets. Dr. Harpalani has extensive training and hands on experience with which he serves the Houston and surrounding areas. Dr. was fine. However, the receptionist was awful, rude, nasty, and very unprofessional. She gets on your name they way she talks on phone and in person and treats you like you owe her something. She acts as a prosecutor!! Shethreatens you and keep telling you that all conversion are recorded. It has reminded me of the experience i had growing up in a less democratic country: no customer orientation, long wait time, not even an attempt to try and build confidence and less than desirable facility. The doctor has spent timeduring my visit trying to train his assistant on how to use their system than he has ever spent on me. The best was when he has spoken about my wisdom teeth... which never have existed, i don`t even have the root for them, very clearly visible from my X-Ray, even for non dental people.... Coming to this country i got a lot of warning about poor quality of dentists, but i did not want to believe it. Now i know. I don`t even understand how this place has a license, smelling like cheap coffee and having the Xray machines on the hallway... The treatment plan they have pulled together was not addressing my situation, but rather a money making machine for them. Luckily i have found a more decent place in the meantime which treats me as i expect in a 21st century democratic country as s customer. Very fast, professional and precise. The office is amazingly set up and comfortable. He seemed more concerned about completing the procedure than if client is comfortable. He didn't pay attention to how uncomfortable I was. I am terrified of dentists,,,,Dr. Harpalani and his staff were wonderful...have no qualms about any future visits! Dr. Monti Harpalani, DDS has no appointments on Zocdoc right now.